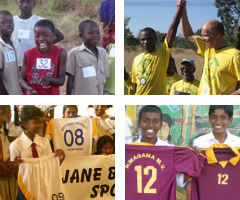 The Jane Bubear Sport Foundation was set up in 2009 to help people in communities under challenge through the provision sports kit. The charity is named in honour of Jane Bubear, who was a British international waterski champion who died of cancer at 37. Read more about our work and ambitions in the coming pages... and please help us to help thousands more people.